Once there was a little girl who, although I didn’t know it yet, was to be the first of three for my wife, Cassi, and me. The little lass loved books. More than that she loved having them read to her at bedtime. Being English majors and book lovers to boot, we were all over that. One day my daughter received a new book, “How I Became a Pirate” written by Melinda Long and illustrated by David Shannon. It’s a whimsical, lyrical tale of a young soccer player named Jeremy Jacob. The tale begins with Jeremy Jacob digging holes and building castles while at the beach with his family. Lo and behold, along comes Braid Beard and his band of pirates. They need a good digger to bury their treasure, so they welcome Jeremy Jacob into their company. He learns to swab the deck, eat with pirate manners (which means no manners at all), sleep with one eye open and, best of all, talk like a pirate. He tries to teach the pirates how to play soccer, but the ball sails into the ocean; big shark-gulp-“Arrrr, Soccer!” In the end, Jeremy Jacob buries the treasure chest and the pirates return him to his family just in time to join his team – the Pirates – for a soccer match. There are hilarious lines to be whispered, lines to be hollered by the reader and lines to be shouted back by listeners. It’s fun. We read it to our daughter over and over and over again. Then came our son, and we read it to him over and over and over again, too. Three years later our youngest, another girl, was born. And again… well, you get the picture. By then I could pretty much recite it from memory. 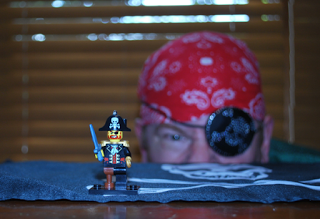 Somewhere along the line I heard about International Talk Like a Pirate Day, observed every year on September 19. People all over the world celebrate it with fake eye patches and beards, Jolly Rogers aloft and downright horrible pirate banter. Boys, young and old, love to pretend to be buccaneers. Sharing “How to Talk Like a Pirate” with my children reminded me of that. And when I learned there was an entire day set aside for acting like one? My head nearly exploded. Oh, yeah, I almost forgot – September 19 also happens to be my birthday. The kids do their own bedtime reading, now, and it’s usually not “How I Became a Pirate.” Even so, when we cleaned out the house recently we couldn’t bring ourselves to add it to the donate box. Probably never will. So every year on this day I pull the book down from the shelf, give it a read and even shout out my favorite lines. Then I strap out the ol’ eye patch, wrap the red ’kerchief around my noggin and riotously fail at talking like a pirate. A wonderful book, a predisposition to swashbuckling and a highly coincidental alignment of my birthday and a goofy, made-up holiday – that’s how I became a pirate, and why I cut my cake with a dagger rather than a proper knife. Me name be Red Beard, by the by; whisper it with fear, ye scurvy dogs. Happy International Talk Like a Pirate Day. Read a good book to your kids and feel free to yell “Ahoy!” at random intervals. Just go easy on the grog. Previous Previous post: Here to There. It’s Everywhere.